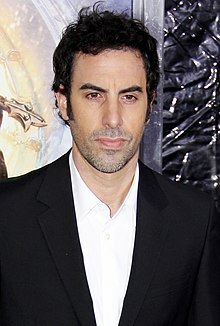 Sacha Noam Baron Cohen (born 13 October 1971) is an English comedian, writer and actor. He was born in Hammersmith in London. Cohen is Jewish. Ali G - An English "wannabe" (someone who wants to be something they are not) rapper. Bruno - A gay fashion reporter from Austria. He also made a movie about the character Borat called Borat: Cultural Learnings of America for Make Benefit Glorious Nation of Kazakhstan. This movie made Cohen an international celebrity. In 2009 he made a movie about Bruno called Brüno. The movie about Borat made about $26.4 million in its debut. In 2012 Cohen played Thénardier in Les Misérables. In 2012, Cohen made a movie called The Dictator in which he played Admiral General Aladeen. Cohen became engaged to Isla Fisher in 2004. The couple married in 2010. They have two daughters and a son. This page was last changed on 6 March 2019, at 11:46.